Pretty flying fairies (the Love fairy and Friendship fairy) with tinkling bell feet, sparkly dresses and sequinned hair. 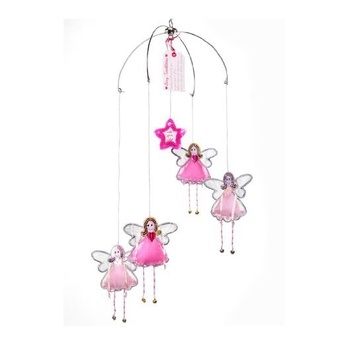 An extra special room decoration and a lovely gift for the girl who loves fairies! Poem can be personalised with their name. Star in centre with 'Believe You Can...' on the front and '...wish upon a star' on the back. Flat packed in an organza gift bag. Size: 50cms when hanging.